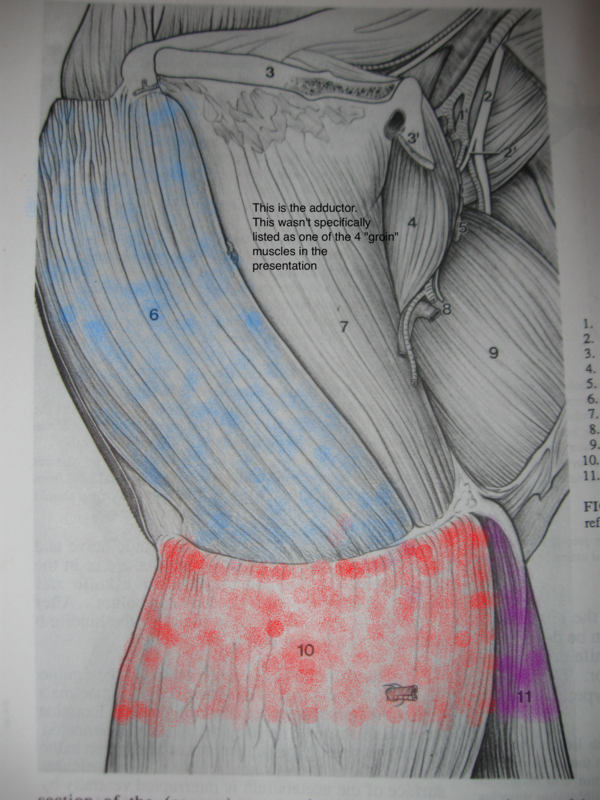 There are 4 muscles that Dr. Marcella cited as part of the “groin”. The semimembranosus m. gracilis m., semitendinosus m. and sartorius m.
There are other muscles in that area beyond these 4 – as you will see it is VERY complicated. I’m not particularly enthusiastic about anatomy, however I do think there’s some value in looking at the 4 specific muscles he listed. Just realize that all these muscles (and others) work together to stabilize and pull the leg towards the middle of the body. 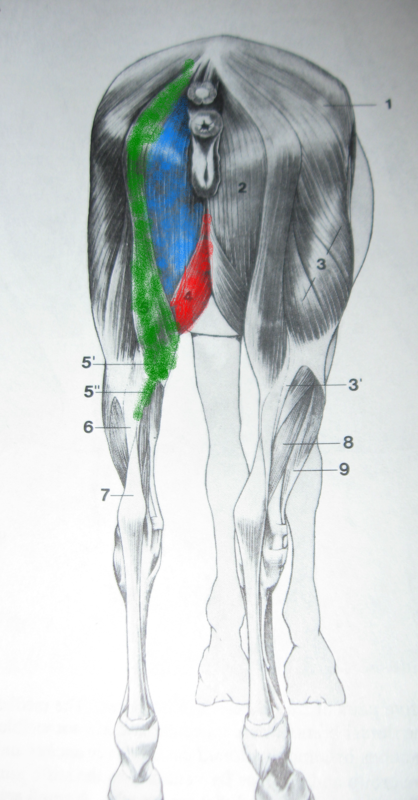 Once he introduced these 4 muscles, he didn’t really continue to “name name’s” instead, referring to them as a group of muscles of the inner (medial) thigh that complete a function together. In the following diagrams I have painsakingly color coded the four muscles in question (the things I do for you guys at 6am…). 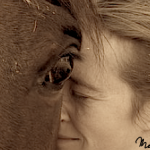 View from the back of the horse. Note that the sartorius isn’t visible since it’s more forward on the inside of the leg. Now we have cutaway the horse to the point where we can see the inside of the thigh. In this diagram the tail is towards the left and the head is on the right. Note that the red gracilis m. covers most of the inner surface. Here you can see the sartorius (purple). 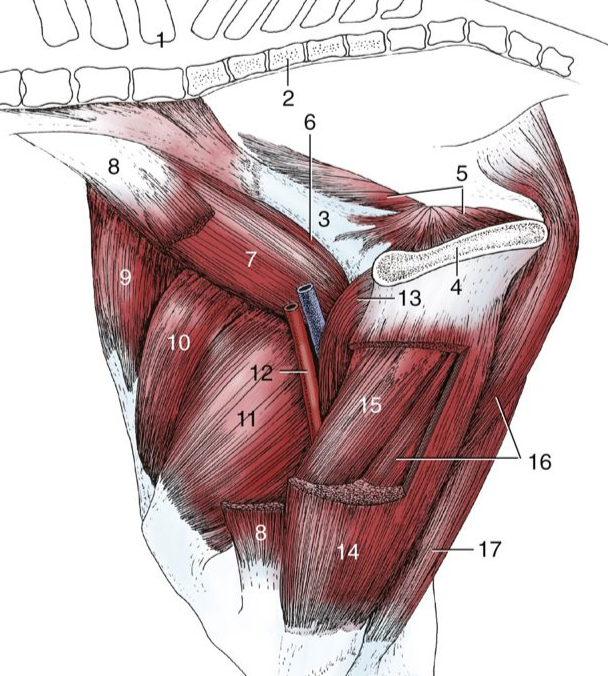 It’s actually quite difficult to find good illustrations of the groin muscles of the horse (even more challenging to find good pectoral m. diagrams…..). I never found one I was totally satisfied with that showed the sartorius m. well. 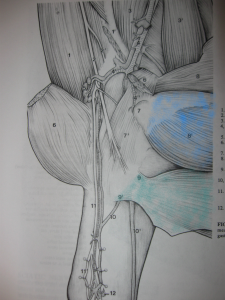 Here’s a diagram from a different text (Dyce’s textbook of veterinary anatomy) that show’s the sartorius m. (#8). It’s cut away in the middle so you can see the underlying muscle, but at least you can see where it comes from and where it goes. Note that this diagram is reversed from the diagrams from Sack’s – the tail is the RIGHT in the diagram below. 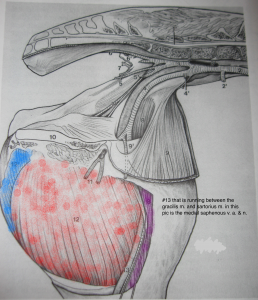 For orientation….#14 is the gracilis (red in the above diagram, partially cut away in this diagram), #15, and #16 are the semitendonosus and semimembranosus muscles respectively. Back to dissecting our inner thigh. 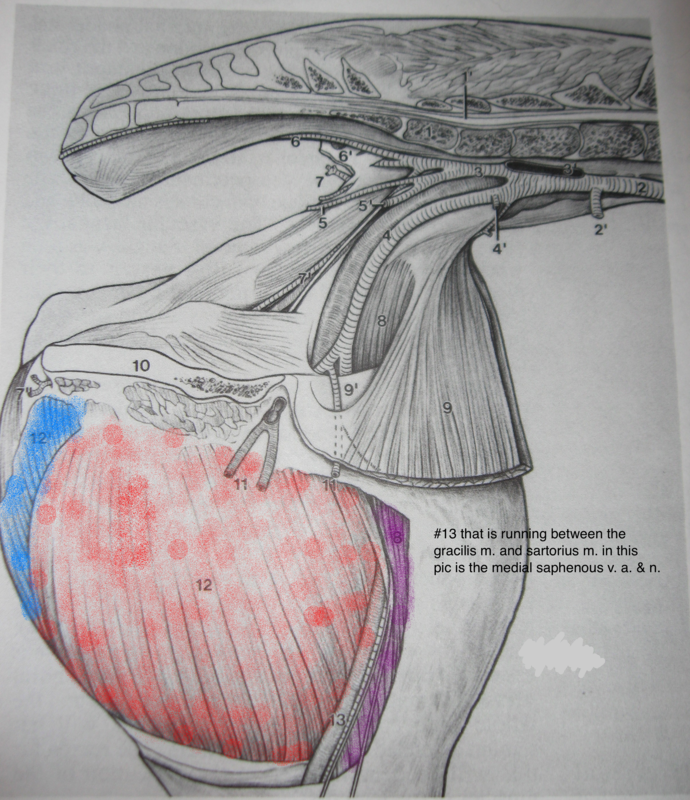 In the diagram below, the gracilis (red) and sartorius (purple) have been reflected away so now you can see the blue semimembranosus muscle that appeared as a little tiny strip in both the other diagrams. It’s actually quite a major muscle!!!! Reflecting the semimembranosus down reveals the semitendonuses m. (green). And just a reminder of of how many complex muscles are in this area that we are NOT talking about, look at all those muscle attachments when you dissect down even further!!!!!! Muscle attachments to bone are important. Do you remember what attaches muscle to bone? TENDON. See – all those tendons in the lower leg have muscles higher up – it’s just an elongated muscle to bone connection. Just because it’s a sheet of fibrous tissue attaching the muscle to bone doesn’t make it any less of a tendon than the rope like tissue that attaches the muscle to bone in the leg. Can you guess when you have a muscle pull in the groin, where that injury occurs? And the healing process to heal damage in the tendon in this area is much like the healing process in tendons in other areas of the body. You are welcome! I’m glad these posts are helping people :). From the number of views that the groin muscle posts get I have to conclude that other people had just has much trouble as me trying to find good pictures and explanations as I did. Just not a lot out there. 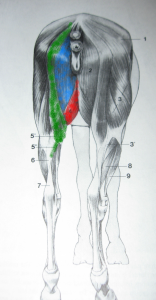 Have you come across any mention of twitching in the groin area of a horse…looks like the gracilis muscle?